San Francisco is the home of the 1960s “experience,” and to celebrate the 50th anniversary of the Summer of Love, the de Young Museum is celebrating with a summer-long exhibit. In the mid-1960s, artists, activists, writers, and musicians converged on Haight-Ashbury with hopes of creating a new social paradigm. By 1967, the neighborhood would attract as many as 100,000 young people from all over the nation. The neighborhood became ground zero for their activities, and nearby Golden Gate Park their playground. The Summer of Love Experience: Art, Fashion, and Rock & Roll is an exhilarating exhibition of iconic rock posters, photographs, interactive music and light shows, costumes and textiles, ephemera, and avant-garde films. 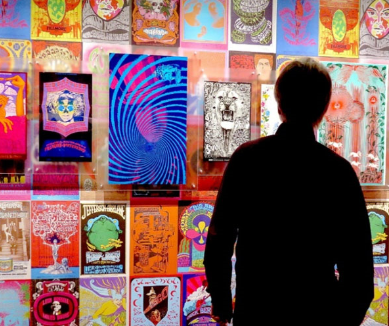 A 50th anniversary celebration of the adventurous and colorful counterculture that blossomed in the years surrounding the legendary San Francisco summer of 1967, the exhibition will present more than 300 significant cultural artifacts of the time. This exhibit commemorates an “only in San Francisco” social and aesthetic movement, and will remind museum visitors that in a time of international upheaval, the city played a vital role in changing society and amplifying the pulse of the nation.